SANTA ANA - Join us for the fifth annual Downtown Santa Ana (DTSA) 5K Run! This FREE event will take place on Saturday, October 20, 2018 from 8:00 a.m. to 10:00 a.m. beginning on Main and Fourth Street. Test your endurance and speed as you pass by Santa Ana historical landmarks including the Orange County Courthouse, Eddie West Stadium and Old City Hall. First, second and third place winners in both the men and women’s divisions will receive a custom plaque and all participants will receive a custom medal to commemorate the event. Post – race refreshments and healthy snacks will be provided to race participants. Those interested in participating in the free 5K run are encouraged to pre-register for an opportunity to receive a free event t-shirt. T-shirts and participant medals are limited and will be provided while supplies last. To register for the FREE 5K Race, visit https://register.chronotrack.com/r/43558. Pre-registered runners will have the opportunity to skip the lines on race day and pick up their runner’s bib on Friday, October 19 at the Plaza Calle Cuatro between 4:00 p.m. and 8:00 p.m. The Plaza is located on Fourth and French Streets in Downtown Santa Ana. After the 5K run, runners and all event attendees are invited to stay and visit the Health Resource Fair taking place between 8:00 a.m. - 10:00 a.m. Local health and wellness organizations will be handing out free giveaways, discount coupons to classes or services and sharing exciting information on available community resources to stay fit, healthy and thriving in Santa Ana! Booth spaces are still available for health organizations who would like to participate in the Fair. 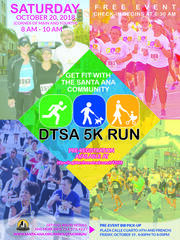 For more information on the DTSA 5k Run or the Health Resource Fair, visit www.santa-ana.org/parks/DTSA5KRun or call the Special Events Office at (714) 571-4227. ¡SANTA ANA - Acompáñenos para la quinta edición de la Carrera de 5 Kilómetros (5K) en el Centro de Santa Ana! El evento se llevará a cabo el sábado, 20 de octubre del 2018 de 8:00 a.m. a 10:00 a.m., empezando en las calles Main y Cuatro. página:https://register.chronotrack.com/r/43558. Corredores pre-inscritos tendrán la oportunidad de evitar las líneas el día de la carrera y recoger su babero el viernes, 19 de octubre en la Plaza Calle Cuatro entre 4:00 p.m. y 8:00 p.m. La Plaza se encuentra en las Calles Cuarta y French en el Centro de Santa Ana. ¡Después de la carrera, corredores y el público presente están invitados a visitar la Feria de Salud llevándose a cabo entre 8:00 a.m. a 10:00 a.m. Organizaciones promotoras de salud y bienestar locales estarán repartiendo regalos gratis, cupones de descuento para clases o servicios y compartiendo información interesante sobre los recursos disponibles para mantenerse en forma y saludable en Santa Ana! Espacios todavía están disponibles para las organizaciones de salud que se interesen en participar en la Feria. Para más información sobre la Carrera DTSA de 5k o la Feria de Salud, visite www.santa-ana.org/parks/DTSA5KRun o llame la oficina de Eventos Especiales al (714) 571-4227.